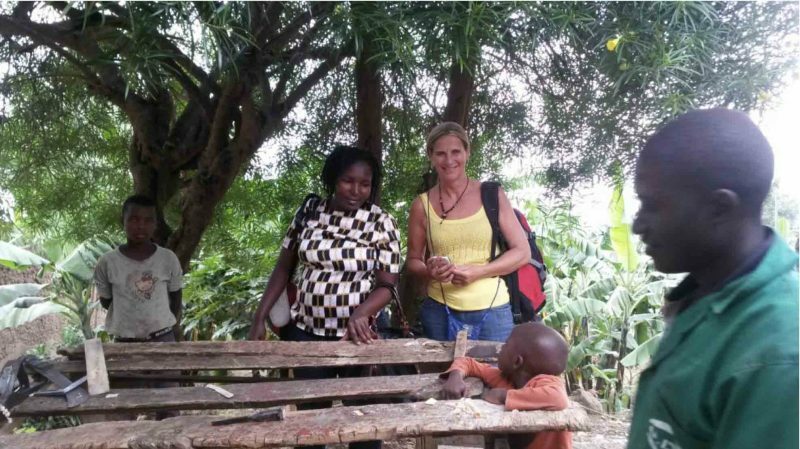 Integration in Ausbildung benachteiligter Jugendlicher – Friends of Ruanda e.V. Zwei junge Damen machen eine Näherinnenausbildung in einer Schneiderwerkstatt und sind inzwischen in der Lage Kleidungsstücke zu fertigen. Der junger Mann im Schreinerei Schreinereibetrieb wird in der Herstellung von Möbeln ausgebildet. Dieses Projekt wird über den Verein von zwei Interessierten gefördert, die unserer Arbeit nahestehen. 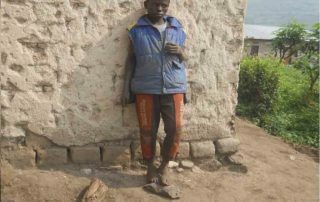 Im Sommer 2015 konnten sich einige Mitglieder von “Friends of Ruanda e.V.” von demerfolgreichen Handwerksprojekt überzeugen. 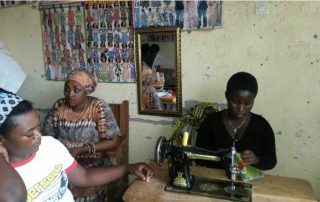 The aim was that the girls can learn basic skills about how to use machines of tailoring and to make the women shirt. The girls are Ok they are learning from Monday to Friday from 8h00AMto 4hooPM. The teacher is giving them the time to work alone after giving them an example and with this system everything is ok because they have the time to make what they have seen. For the teacher there is no problem the girls are learning well they both have the courage and the will to learn that is why they have until now good evolution. 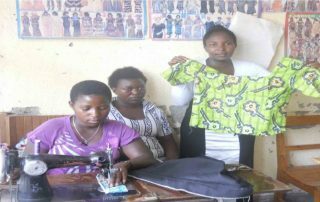 As the result now students can manipulate the machine alone and begin to make different things from the tissue but especially this month they have learnt how to make the women t shirt and they have made it. As challenge, for the teacher there is no challenge because for her, the trainees are having good evolution. For the girls there is no problem also because they are saying that everything is ok and when I see what they are doing many can appreciate. As recommendation, if possible we can continue to support the street girls because they have the will of changing their life. 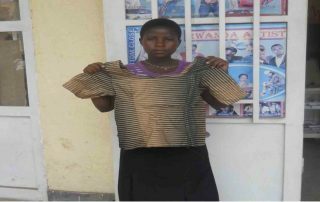 In the last month the aim was to learn how to make a kind of women‘s t shirt. As the result now the twogirls know to tail a women ’s t shirt themselves. They know how to take measures foe each client ,howto cut the tissue ,then they can begin to tail the tissue until they get the cloths to wear. 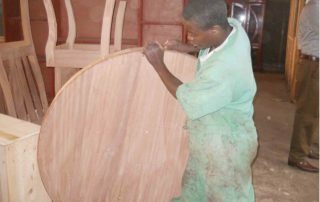 The aim was that the kid can know to use different materials of carpenter and that he can start to take the measures so that the kid can start to initiate different materials from those parts of the woods. The kid is learning from Monday to Friday and has the rest of one hour at noon, and he has a restaurant where he takes the food every noon. For the teacher the kid is very interested and he hopes that the kid will become a good carpenter because he has the courage and the will but also for the kid says that everything is going ok with his teacher. 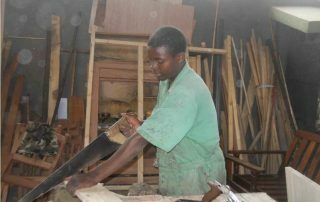 The kid is learning well now he can prepare different small woods that he can initiate after and make something useful from it and he can take measures while he is preparing to make a given materials . As the kid now is learning how to make the cheer and now he knows how to cut the small woods with good measures that he can initiate and get a cheer. 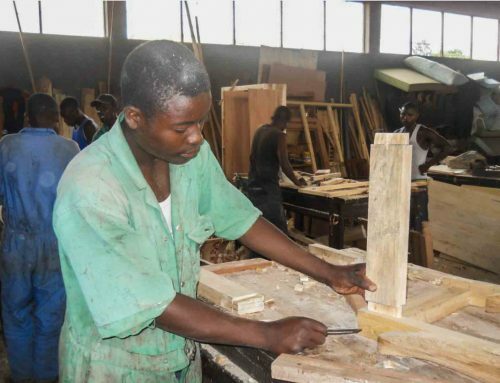 As a suggestion, if we can get the possibility we can continue to support kids for making carpenter workshop because they appreciate it and by this way they have the hope for a better future. 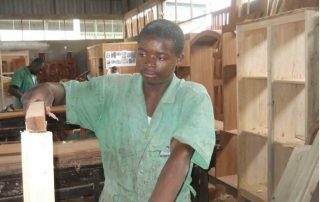 During this last month the kid continued to do many technical practices in carpenter career. The trainer is taking the time for teaching by showing examples then he lets the trainee remakes it himself and the trainer correct during or after the trainee ‘S work. Now the kid can paint well a finished material, initiating different parts well, measuring and cutting well, reinforce when he fixes two parts by using a harmer, make some holes in a given part of the wood. 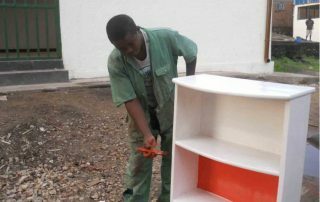 Now he can take a wood because he knows how to use many materials from carpenter, and using theskills he has gotten in last month’s he can get a complete material like a cheer ,a tablet then he can paint it well. By concluding, the training is working well. 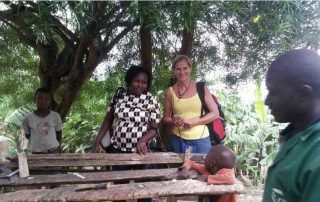 › To make the meeting or CENTER DAY, for the project in order to find together how we can meet each month as street children who are now reintegrated and stay in their families. 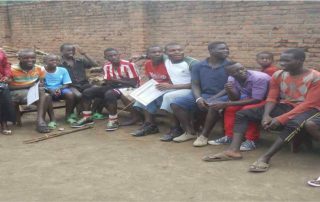 6 families were visited kids are ok they are home but because it is at the beginning of studies they are asking themselves and to their parents how to find schools materials and school fees. On 31 January, one week before all kids supported by the project who are not from far areas were invited to the meeting which was held at ABADAHOGORA CENTER but for reintegrated kids. 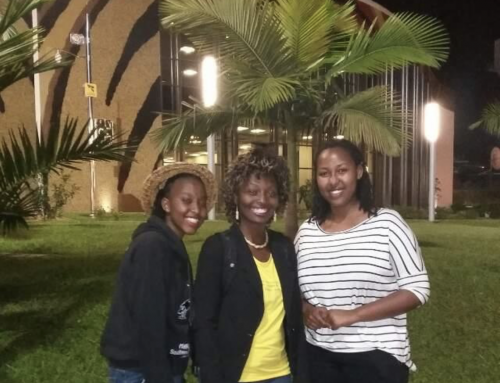 The aim was that we meet, look for what we can do so that these youth can be developed and to evaluate one by one if he is trying to change his conditions for a better future and to plan at which day we can meet each other like the youth supported by the project. As the result the meeting was made by 20 boys and 1 girl ,we discussed about how we can reinforce our fight for a better future through conversations ,games ,and music’s ,and especially by investigate in studies. We have found that some of our kids are studying one (UWAMBAJIMANA Bienvenue)is even reaching the 5th form of secondary school, and another NSENGIYUMVA Aboubakar is Reaching the 4th form of secondary school ,and this is a good step of those kids even though they are studying in hard conditions without school fees and school materials . And now we have a group of music made by 10 kids but this group is functioning as one for reintegrated kids, and this can help when we will have to meet. The date of meeting is the last SATURDAY OF EACH MONTH. After the meeting we wish that kids from far areas can get a ticket because it is hard to go on foot reason why in the meeting we were not many, but also some have gone to school. As the suggestion ,when we get the capacity we can support kids who are studying, provide materials to kids who made and finished the workshops support this group of music by buying uniforms and a radio, provide the ticket for the kids at the meeting day because it is important to meet in order to make our project strong.